This was already a fantastic design, but I've made another harness for the reindeer. This one allows for a reindeer in front (Rudolph!, I glued a pinhead on the nose). 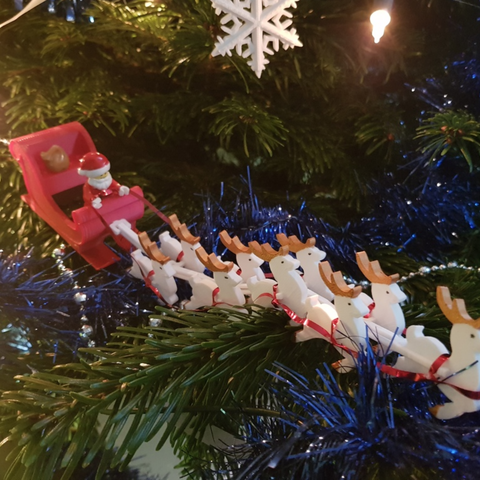 Also, it is build of links that form a chain and allow some movement along the harness and you can vary the number of reindeer by adding or subtracting links. 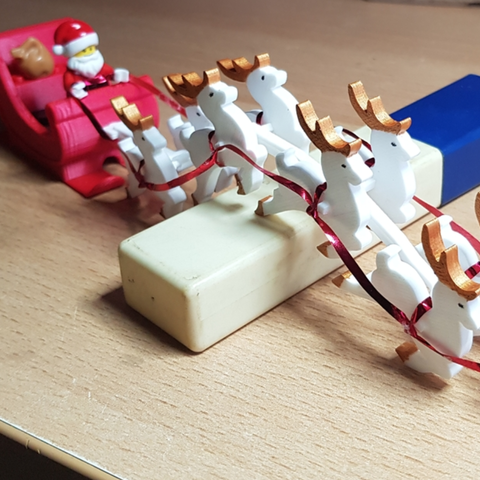 Just attach the Start Link to the sleigh and snap the links to it. (The reindeer still have to be glued to the links though). I've added the files for the separate links as well as the collages I've used for the assembly with 9 reindeer. Alternatively, you can position the links with the t-shaped front down to the building plate. This will save a lot of support, though it might need a raft because it will get relatively tall.